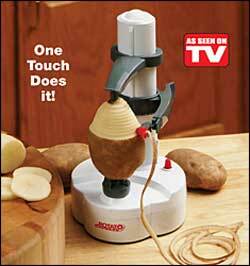 Peels mounds of potatoes in seconds! Rotato® Express peels mounds of potatoes in seconds! Push a button and watch it go! Peels apples, pears, oranges, lemons, even turnips, cucumbers and zucchini. You’ll never peel another spud by hand... guaranteed. Rotato® Express peels away skin or rind. Make potato salad, casseroles, fruit pies in record time. Measures 11" high on nonslip base. It will be your most-used tool!